You've been patient. We've been hard at work. And now, finally, we have a new Louis Kincaid thriller for you. And this one is very specialfor us, and for Louis. Our long-time readers know what turns and twists Louis's life has taken over 11 books and 15 years. And now, with THE DAMAGE DONE, we promise you won't be disappointed at where he finds himself. As for all of our new readers who are just discovering us and Louis, you won't feel at all lost if you start with this story and maybe go back and read the earlier books. Louis Kincaid is wearing a badge againas part of an elite homicide squad. But his return to his Michigan home comes at the bidding of a man who once set out to destroy him. When the cold case deaths of two little boys collides with thee white-hot murder of a mega-church minister, Louis finds himself fighting to unearth the secret past of his police captainand the demons of his own childhood. "The past and the present come into stunning focus in this brilliantly crafted thriller. 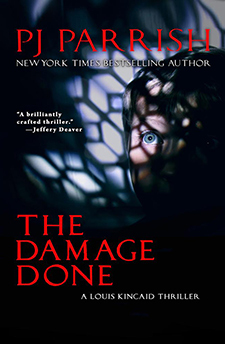 Relentlessly plotted yet filled with poignant family emotion, The Damage Done will grip you from start to finish." 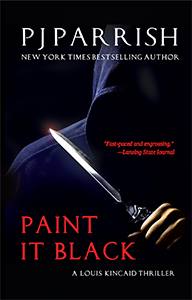 "Welcome to the Michigan State Police Special Investigations Unit, where cold cases turn red hot and Louis Kincaid finds himself a disturbing new home for his skills, his compassion, and his relentless obsession with rendering justice. 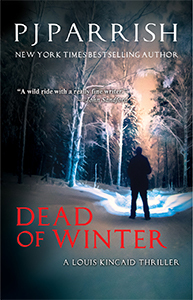 A gritty thriller with a high-octane pace and beautifully evoked sense of place." 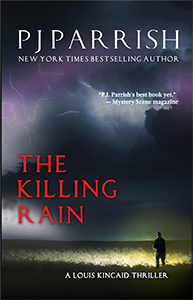 "For the last decade and half, PJ Parrish has delivered one fine thriller after another featuring the complex and compelling Louis Kincaid. THE DAMAGE DONE is no exception. With a pace that never flags, dialogue that pops like a string of firecrackers, and a cast of characters so intriguing you can't look away, this newest Kincaid novel highlights the mastery of a writing team at the top of their game." 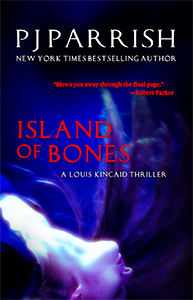 Our 2013 Louis Kincaid thriller HEART OF ICE won the Shamus Award, from the Private Eye Writers of America. The award is given out at the Bouchercon conference every year. Alas, because of book deadlines, we couldn't attend. But our friends and fellow writers Michelle Gagnon and Greg Herren were there and created this lovely tribute. Thanks to all our loyal readers and lovely friends! Have you noticed that series thrillers all seem to have the same look? It's for a good reasonso readers get a sense of continuity, whether they are buying a new Louis Kincaid book or searching for old titles. So we have redesigned some of our early books to match our new release THE DAMAGE DONE. Also: These books are now available for your favorite bookstore to order! They are beautiful new trade paperbacks. We wish we could offer you all our titles in this great format. But alas, authors can only reissue the books to which they own the rights. So if you see other covers out there, it's because our previous publishers still have control over the covers. She's desperate to remember. He's desperate to forget. She knows her name is Amelia. But after waking up in a hospital battered and bruised with just the clothes on her back, her name is all she knows. Unable to piece together her shattered memory, she's haunted by menacing faces and voices whispering that her nightmare is far from over. She goes on the run, fearing that her husband is the person who tried to kill her. Clay Buchanan is skip tracer, "a liar for hire," who hunts down people who don't want to be found. As he tracks Amelia, he expects this to be just another easy job. But Amelia isn't like his usual preyand his own ghosts are catching up with him fast. 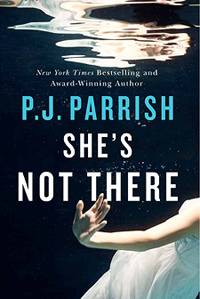 SHE'S NOT THERE is now in trade paperback, eBook and audio. Still here? First, if you don't already know, there are two us. Please use the navigation bar at left to find out more about us, our books, short stories, and how we got here. Take a few minutes to read excerpts from our ten novels, visit some of our favorite places, or browse through our photo gallery and see some of our friends (and maybe some of your other favorite authors). On the inspiration page, you can see some of the real places that inspired our locations and read the stories behind the books. Please feel free to drop us an email to let us know what you think (yes, we read and answer each one!). Thanks for comingand please, before you leave, sign up for our newsletter so we can let you know when new books are on the way. Site design © & maintenance by xuni.com. All content © 2009-2019, P.J. Parrish.